Strictly speeaking this is not a model engineering componant. I have been asked to make 2 carburator needles for an extremely rare supercharged Bentley. The pair of needles need to be 3 inch long with a taper length of 2.5in. The larger diameter is .125in and the smaller end is .100in. this gives a taper of 1deg 25" 50secs which is half the included angle. I will have to turn them with the compound slide as I do not have a taper turning attachment. The material will be nickel rod. Has anyone any experience of make needles for carb throttle slides and has anyong got any advice or helpful comments. This particular Bentley is a Bentley Blue Train, the SU carbs on the supercharger were custom made for W O Bentley and only about 8 of these carbs were ever made. It will be best to set up a grinder of some kind onto your toolpost rather than attempting to turn the needles. Take very small amounts with each pass and make sure the grinding wheel centre is on lathe centre for accuracy of the angle. Make several spark out cuts. I have made several slides plus other bits for pre war Amal motorcycle carburettors but never attempted a needle. Just how you will support the needle when turning is a problem. I think that I would set up in a 5C collet and do it in steps turn around 5/8" length at a time then bring it out some more for the next 5/8"and try to blend it in Good luck, please let us know how you get on. Do you have access to a shadograph ? If you do then you have a chance of checking them and local polishing to get two the same...…. I think the shape of a carb needle is more complex than a simple taper, diagrams of su needles show dimensions all down the taper rather than a simple taper. 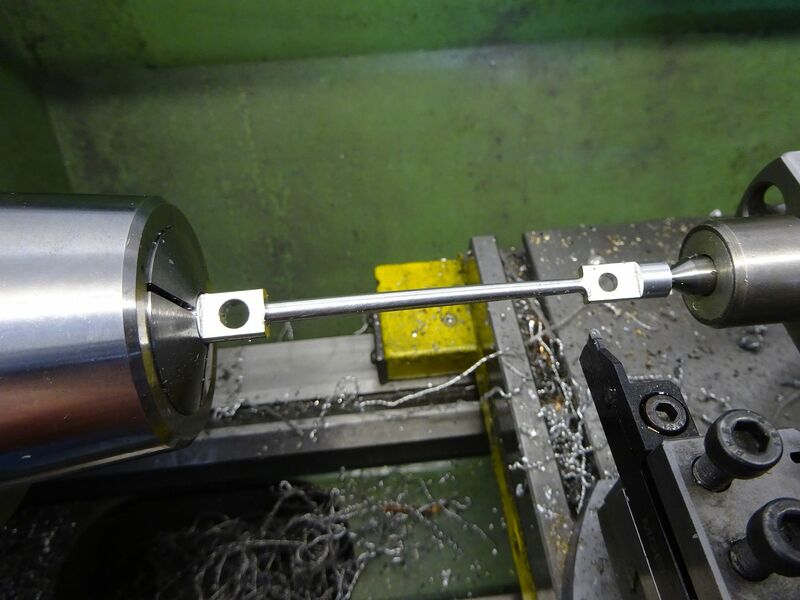 To turn it you will need a travelling steady but that would mean cutting the taper in one pass as once the job is tapered the steady won’t work. Maybe cut a simple taper and then use emery to try and adjust the dimensions. Many years ago I recall seeing a reference to turning such shallow, straight, tapers on slender parts using a full length tapered V groove for support. A tapered V is, theoretically, pretty easy to make by cutting a parallel V in a suitable plate then setting at the appropriate angle and milling the V side flat. I imagine that with a sufficiently slender workpiece the inherent flexibility might be sufficient to permit machining at one setting of the support plate. No idea as to the all important details of the process or even whether it was a report from practical experience or an off the wall suggestion. Setting up probably isn't as easy as it appears on a quick look as the plate probably needs to mount off the lathe bed to retain movement in both compound and cross slides. As Mike Poole says, the needle for a SU carburettor is not necessarily a straightforward taper. Once upon a time I had the SU book showing the dimensions for all their Needles. Stupidly, I gave it away! The diameters were quoted at 1/8 inch intervals, which suggests that not all needles were uniform. I believe that the dimensions were arrived at by running the engine and adjusting the height of a "standard" tapered needle for optimum economy, or power output. From the height and the known taper and dimensions of the datum needle they were able calculate the diameter at each increment to arrive a the required needle shape. Presumably the "new" Needle was then tested on the engine to confirm that the result was what was wanted. They certainly offered standard and "weak" needles for some applications. Another "they definitely aren't a taper" message here. Holding the needle is no problem as I have a Myford collet set and an Er32 and Er20 set. The taper is even and not stepped, the originals were for some reason broken. The actual carbs are basically one offs, they are massive compared with Bentleys standard supercharched SUs. I thank you all for your suggestions. I was thinking of grinding them, I do have a high speed spindle which I could mount on my vertical slide, what I am trying to avoid is making the taper concave over its length. The tapered end of the needle has a point on the end so I will have a go at making a tailstock mounted brass centre support. I may try all of your suggested ideas before I make the actual needles. The actual car was made to run flat out everywhere as it was purely designed for racing the French Blue Train over the Alps. There is no information at all available for these carbs, there is no serial number on them and no archived info about them. The guy I am making these for is one of the foremost Rolls and Bentley vintage car restorers and he can't find any info about these carbs as they were made only for W O Bentley and no one else. The engine is a Rolls Royce straight 6. The car was built between 1928 to 1930 with one the prototype and another copy. There are a few copies about on genuine Rolls Royce chassis and engines but they were built much later. As far as I know my friend has a copy of WinSU and it can't give an answer due to the fact that the car weighs nearly 2.5 tonnes and has a non standard supercharger. I suspect that whatever the profile of the original needles is the engine will run even if you are only close, when I was a boy playing with lawnmower engines I had one with a missing needle, my dad made one with an electric drill and a file and it worked. A Rolls Royce and a lawnmower are rather different beasts but I doubt a home brewed needle will stop it from running even if it is not spot on. This job is a good candidate for CNC. I was going to suggest that you contact the chap who built a one off special Weber for my V8 from Chatsworth Motor Spares, but when I just tried to look up his contact details, Google days that the business is permanently closed. I know he moved the rolling road back home a few years ago, due to complaints from other local businesses, hopefully he's still got it. It's possible that, rather than starting from scratch, he may well have something that you can modify. His name is Eike Wellhausen, and was well known for racing a replica Lister Jaguar. If you can seek Eike out, (hint, Google will help), he may be able to assist. He may come over a quite curt, but when he realises someone is't wasting his time, he's a genuinely decent and helpful guy - I assume he's finally retired at 70 odd, and good luck to him. For your's and others interest, whilst not applicable to your project, when I was running SUs on my V8 I had them set up on a rolling road. Phil's technique was to run the vehicle on a rolling road with an exhaust gas analyser connected. I'd hold the Landrover at 10BHP at the wheels, he'd check gas readings, the reach into each carb in turn with a scalpel and mark the needles. Then strip the needles out, put each one in the lathe and polish them down to his estimated size, at the mark, with fine wet and dry. Then reassemble the carb, I'd hold it at 20BHP at the wheels and repeat the process at 10 BHP intervals up though to full throttle. It went into his workshop on standard needles, but obviously the wrong exhaust and air filter, giving about 65-70 BHP at the wheels and running rich; Landrover series gearbox+transfer box aren't very efficient, so lots of power loss in there, and a more or less straight through exhaust. After being blessed by Phil, MPG about the same, but 110BHP at the wheels. Contact Amal Carburettors. They also own SU, Zenith, solex, amongst others. Part of the Burlen Fuel Group. They also make one-off stuff. Their equipment is bang up to date and their products are better than ever in quality. They will have the tooling to make 3" needles. Why do you nee dto use the compound? Far better to offset the tailstock or better still use a boring head in the tailstock to offset. That way you can use power feed for a nice constant cut and the angle is easily adjusted by moving the boring head a thou at a time. Apologies, Ian ... I wasn't really suggesting it would be of direct usefulness in your specific case. My reference was prompted by Howard's previous comment about the book and the wide range of profiles. That angle works out nicely to 1:200 or 1:100 included which may have been why it was originally chosen. Though being old 1:96 may have been more likely how sure are you of the two diameters? The setover method which Jason illustrates [and which, quite evidently, works for his purposes] will, by bending the component, I think, theoretically generate a slightly convex profile ... In practice, you may get lucky and find that this balances-out the concavity that you are rightly anticipating.